The global bromobenzene market is estimated to witness a CAGR of approximately 4% during the forecast period, 2018-2023. North America is expected to account for the major share of the market, whereas Asia-Pacific is expected to witness strong growth in the demand for bromobenzene, owing to the increasing investments in the pharmaceuticals industry. 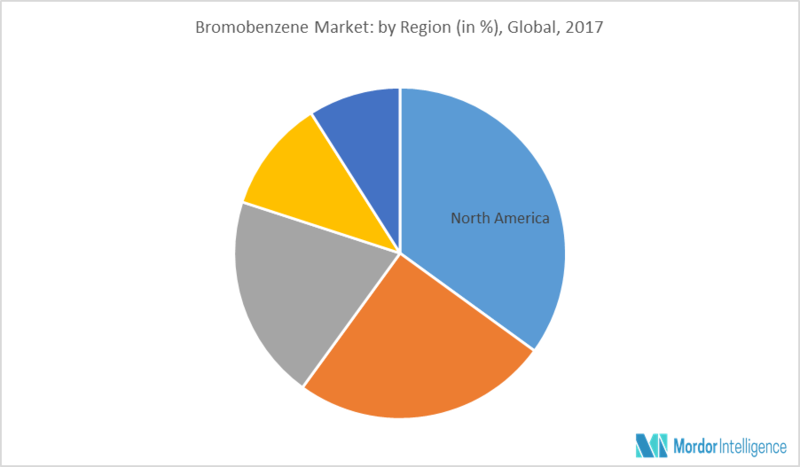 In addition, the growing demand for copolymers, plastics, and emulsifiers is driving the growth of bromobenzene market. Bromobenzene is used as an intermediate in the production of pharmaceutical products, which drives the demand for the bromobenzene in the pharmaceutical industry. Asia-Pacific is witnessing strong growth in the pharmaceutical industry. The presence of emerging economies, such as China, India, Indonesia, etc., the region has been attracting foreign investments into the sector. Hence, the growing pharmaceutical industry is expected to drive the demand for bromobenzene market. Bromobenzene is majorly used in the preparation of phenylmagnesium bromide, a versatile Grignard reagent used to prepare benzoic acid, secondary amines, benzophenones, and other chemicals. Bromobenzene is also used to introduce phenyl groups in coupling reactions, like Suzuki reactions. These reactions are used widely for synthesizing intermediates used in pharmaceuticals or fine chemicals. Additionally, bromobenzene is a precursor in producing phencyclidine, a dissociative drug; bromobenzene is a precursor in the manufacture of phencyclidine, a dissociative drug. North America is expected to dominate the market during the forecast period, followed by Europe. Whereas, Asia-Pacific is expected to witness the highest growth, owing to the increasing investments in the pharmaceutical industry in the region. Besides this, co-polymer and plastic industry has also been witnessing a strong growth in the region. Plastic industry has been witnessing strong growth in the region, fuelled by the emerging e-retail & e-commerce; increasing demand from automotive and rapidly growing construction industry. Hence, the application of bromobenzene in the production of co-polymers and plastics is thus, likely to increase the bromobenzene demand for application with growth in these sectors. Major Players - Hawks Scientific Ltd., Shanghai Wescco Chemical Co. Ltd., A. B. Enterprises, and Formosa Chemicals & Fiber Corporation, among others. 9.2 Chanzhou Elly Industrial Import and Export Co. Ltd.
9.3 Shanghai Wescco Chemical Co. Ltd.
9.6 Weifang Yonhop Chemical Co. Ltd.
9.7 Shandong Henglian Chemical CO. Ltd.